Ochieng (R) at PML Daily newsroom. Left is Atuhaire and in the background is Muhoozi. PML Daily photo. KAMPALA—PML Daily has named experienced editor Henry Ochieng on its senior editorial management team. Ochieng who has more than 20 years of journalism experience having worked for Daily Monitor newspaper from 1996 until April this year is now PML Daily’s senior editor in charge of Politics and Impact a top position in the online publisher’s editorial hierarchy . Announcing the news, PML Daily Chief Executive Officer Richard Muhoozi said the team was elated to work with an experienced editor of Ochieng’s calibre. 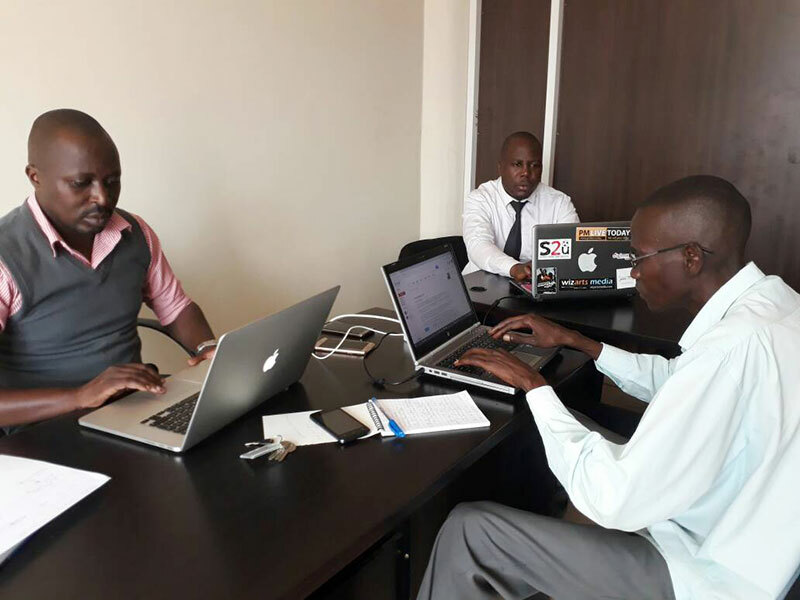 “He will obviously bring in a lot of quality addition to our products as we embark on the journey of changing the Online publishing landscape in Uganda and the region,” Mr Muhoozi said. Editorial Director Alex B. Atuhaire said Ochieng joins the editorial management team with immediate effect. “HO, as we like to call him, will provide our newsroom with great resource both in terms of the thinking processes and implementation as he is no doubt a top editor and writer and is the best you can find in the market in terms of quality content generation and giving direction on political news gathering and reporting,” said Atuhaire. He will oversee top-notch political reporting, take charge of Impact, a new product in the market on the PML Daily online publisher’s menu that will take development reporting to a new level, Atuhaire said. He did not go into detail about Impact. PML Daily went online in June, joining the plethora of online publications in the country. However, while many of the digital media are chase after quick stories and sensationalism, PML Daily continues to strive to “offer mainstream journalism” online within the parameters of media ethics and principles. The news site publishes all kinds of news one would find in mainstream journalism and Ochieng’s arrival is expected to boost the dream quality journalism that the editorial team at PML Daily strives to serve its readers.